Klorane specialises in botanical expertise in haircare, and is fiercely passionate about maintaining safe and sustainable practises. 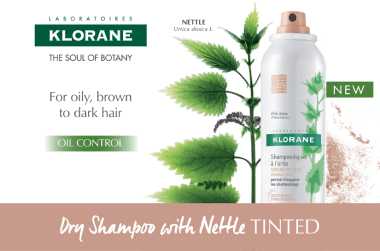 Klorane are a French pharmacy brand that are well-known for their high-quality plant-based hair ranges that tie in the natural properties of plant with a research-focused approach. Plants are carefully selected, their chemical properties well assessed to identify active molecules that are the secret to the efficacy of Klorane haircare. Klorane pioneer the use of natural, pure botanicals within a strict line of respectful, scientific conduct. Klorane develop products that are formulated with plant extracts whilst protecting the earth&apos;s beautiful flora. Just like your daily skincare routine but for your hair, Klorane is gentle yet very effective at treating your hair concerns. Inspired by the beauty and natural ability of plants around the world to conquer the harsh environments they thrive in, whether your hair is dry and damaged, weak and brittle or requiring a renewed sense of balance, Klorane has a range to suit your needs. Which Klorane range is best for my hair type? My hair is naturally blonde, coloured blonde, or has blonde highlights. The Klorane Chamomile range is created for you. Klorane Chamomile range uses Chamomile, rich in Apigenin pigments that naturally lighten and tone blonde hair, and help to reveal lighter tones in light brunette hair. My hair is dry and/or damaged. Beautiful for both your hair and the environment, The Klorane Desert Date range launched in 2012, and has helped to plant ten thousand desert date trees per year to assist impoverished regions, and to improve the ecosystem. With a high concentration of fatty acids and natural antioxidants, the Desert Date range helps to restore and nourish depleted hair types. My hair is limp, thinning or fine, and needs volume. Harnessing the light and delicate nature of Flax, this lightweight yet structured plant lends its benefits to your hair. Thus, was the Klorane Flax range inspired to volumise hair, and give boost to thinning hair. Your hair is left looking more voluminous and is well supported from the roots. Your hair is full of life and movement. For additional boost, try a Klorane Dry Shampoo for extra lift at the roots. My hair is normal to dehydrated. Mango is protective and nutritive to the hair, rich in antioxidants and essential fatty acids that hydrate the hair, without weighing it down. Klorane Mango range is designed for hair that is normal or dehydrated, helping to give smooth, frizz free finishes. My hair is normal to sensitive. My scalp is normal to sensitive. Klorane is famous for its Oat Milk Dry Shampoo, which harnesses the power of natural oats to soothe. Klorane also has an Oat Milk Range of shampoo and conditioner in addition to the dry shampoo, which is ultra-gentle. This range is rich in lipids and vitamins to protect and soften your hair. My scalp is itchy or uncomfortable. Peony is naturally rich in paeniflorine, which is a compound known for its soothing and anti-irritant properties. Try the Klorane Peony range that is designed to help balance uncomfortable, inflamed or itchy scalps. My hair is coloured and I want my colour to last longer. The Pomegranate range is ultra-concentrated in antioxidants, which are exactly what you need to prevent your hair being damaged by environmental aggressors. Klorane uses pomegranate that has been harvested by hand and dried in the sun to concentrate the active ingredients. My hair is thinning and needs to be strengthened. A South American tree known for its ability to fortify, Cinchona is the special ingredient in the Klorane Quinine Strengthening range. Your hair fibres are both protected and strengthened, for a look that is more luscious and healthy. Adore Beauty is an official Klorane stockist. Free express post to Australian addresses, for non-flammable orders, over $50. I do like this dry shampoo and it is very effective, but for the price I&apos;m unsure I would continue to buy over a more economical brand. I&apos;m not a huge dry shampoo user though - only when I&apos;m desperate! So maybe I&apos;m happy with something simpler for my occasional use? I used this in the morning and had the coolest fresh sensation when the breeze blew through my hair in the evening very happy with this peony scalp spray! I like this is a shampoo but I wouldn&apos;t say it&apos;s volumising. I might try the conditioner with it and see if it&apos;s better. I have dry fine hair and this is a gentle but effective shampoo that doesn&apos;t weigh my hair down. I only notice the volumising effect when I blow dry my hair after, and it&apos;s just minimal, like a lightness rather than boosted roots.